Here's Why Sony's PlayStation 5 (PS5) Will Be The Next Big Thing In Gaming! It’s no secret that both tech enthusiasts and gamers alike are excited about Sony’s next-generation hardware – PlayStation 5 (PS5). In fact, it is expected to be this next big thing or will bring the gaming experience to a whole new level (or the next level by the very least). But what does that mean actually? Will it be a mind-blowing device or something? Well, Seeking Alpha’s Bohdan Kucheriavyi shared his thoughts and opinions about why the PS5 will be the next big thing in gaming. When people hear/read the word “Sony”, chances are, “gaming” and “PlayStation” are what comes to mind. This isn’t really surprising though. 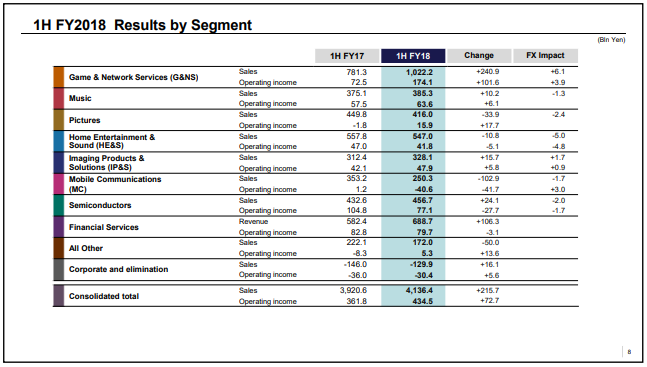 Take a look at this earnings report for the first-half fiscal year 2018. As you can see, top of the list is “gaming” followed by “music” and then “pictures”. As mentioned by Kucheriavyi, on the first-half of the current fiscal year, sales and operating income of the gaming division increased by ~30 percent and ~40 percent, respectively. As a matter of fact, it was revealed on a report that by the end of 2017, Microsoft only sold roughly around 30 million Xbox Ones while Sony surpassed the 73 million mark. The disparity between the two gaming consoles was shocking despite the fact that both consoles were launched in 2013. Regardless of whatever the reasons are that caused it, perhaps one of the obvious reasons is the $100 price tag difference. The PS4 launched with an introductory price of $399, while Xbox One launched with $499. Eventually, Microsoft dropped the price a few months later by removing Kinect. But still, the damage was already done. Sony’s Vision Is More In-Tune With Gamers? Another factor pointed out by Kucheriavyi is Sony’s vision regarding the future of console gaming. Although both Sony and Microsoft are in a console, both of had different approaches. With Microsoft, aside from Xbox One’s launch price, the company decided to make the Xbox One a multi-media device instead of one its core audience. We (73Buzz) are assuming that this “core audience” mentioned by Kucheriavyi is the gamers. Meanwhile, the “multi-media device”, well there was Microsoft’s focus on home entertainment for the Xbox One. With the Xbox 360, it was more than just a console. It could play DVDs, run apps like Netflix or Hulu, and serve as a music player. However, with the Xbox One, the company took that a step further. At the console’s reveal event, the company spent more time on unveiling non-gaming features which didn’t sit well with the audience. Add up the revealed price tag, it was already a lost battle. Of course, there were also other issues as well that made fans pissed off with Microsoft’s Xbox One. But that’s up for another topic. Meanwhile, Sony, on the other hand, focused on games. The company spent quite an amount of effort in expanding their library of games. In addition to that, they also promoted additional gaming services that in the long run made PS4 the best platform of the eight generation of consoles. With the PS5, it is rumored to be packed with an eight-core processor from the AMD Ryzen series and will support 4K and backwards compatibility. Last September, on an interview with CNBC, AMD CEO Lisa Lu shared that they are working closely with Sony and Microsoft on some “secret” features. There’s also VR support. Apparently, a new virtual reality device – presumably the PSVR 2 – is going to launch along with the PS5. In fact, we’ve seen some PSVR patents here and there these past few months. One of them was for combating motion sickness. The PS5 could also be closely integrated with portable devices. Thanks to the success of the Nintendo Switch, companies are taking inspiration from it. Although some reports speculate it’s related to the PS5, some also speculated it has something to do with the PlayStation Vita which was launched back in 2011. Perhaps it will have a successor? Lastly, there was a patent for a Sony controller. It’s unknown whether intended for the PS5 or not. However, the patent shows that the controller is no different with the currently available DualShock controller, but it will feature better battery life and a touchscreen. As you can see, Sony is heavily focused on gaming. But do you agree with this approach? Or would you prefer Microsoft’s vision, focusing on a multi-media device for a broader audience? Tell us in the comment section below.